In the wake of Super Bowl XLVIII, it’s no secret that social TV has the potential to bring the “watercooler conversation” into the living room. Despite the fact that Super Bowl ratings fell to a four-year low, Facebook reported that 50 million unique global users communicated about the big game via Facebook or its apps during the broadcast. According to MarketingLand, This amounted to 185 million “interactions,” roughly 3.7 interactions per person on average. Along the same vein, advertisers hoped that the actions taken on our mobile devices kept us focused on the commercials in tandem, popularly by suggesting hashtags during ad breaks. 13.7 million people tweeted about the Super Bowl, with hashtags mentioned in a record-breaking 57% of ads. 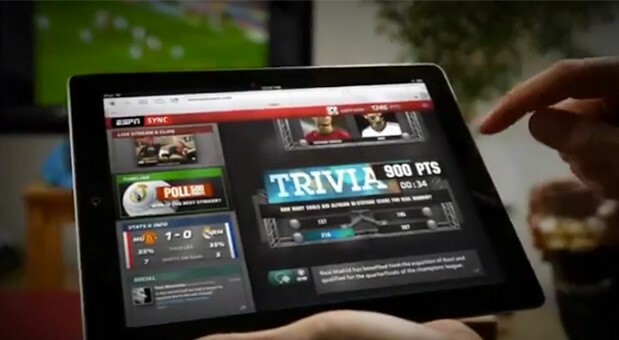 ESPN Sync brings dedicated real-time sports coverage to the second screen (via Engadget). Such social TV tactics seem to be paying off during live broadcasts, but what about the battle for consumer attention during cable premieres or syndicated programming? And, what about on-demand difficulties (as referenced in my last post)? Many brands attempt to keep consumer attention on the TV during programming itself by airing live tweets or Facebook posts at the bottom of the screen (if you’ve ever watched Bravo reality TV, you understand. It’s a part of my past I’m not proud of either). Other popular tactics include using mobile apps that feature exclusive content or gaming components related to programming, the use of content synchronization through TVTag (formerly GetGlue), and live Q&A with the show’s creators, producers, or character actors. HBO has seen success using these, and additional tactics, to engage viewers pre-, during, and post-airing of popular series like True Blood and Game of Thrones – a formidable feat to tackle behind a premium paywall and popular on-demand viewing via HBOGo. It’s starting to work for brands and networks alike: according to BI Intelligence, 53% of consumers with tablets or smartphones have engaged in mobile-based activity related to what they’re watching on TV. But, are these tactics strong enough to hold attention and ultimately, to drive action? That’s the question brands must consider when planning and budgeting for the future of social TV. As consumers collect devices, attention is divided more than ever. It’s short-sighted to believe that the television will always remain the first screen for consumers. As of November 2013, Mediabistro reported that 39% of viewers already use their smartphone or tablet while watching TV once per day (check out more stats in their nifty infographic). Brands must plan on the fact that our televisions are becoming the true second, or even third, screen, while our smartphones and tablets enjoy priority. Know your consumers (and viewers). Although this may sound biased with my career field in mind, you can never know enough about your customers. Research should be the foundation for every media, advertising, and marketing decision – regardless of platform or medium. Although the data supporting social TV’s growth is promising, it’s only relevant if your customer base is apt to concentrate its energy on mobile platforms in conjunction with (or in replacement of) more traditional television entertainment. Remember: it’s a battle for attention, so engagement must guide your decisions. Measure where (platform or medium) and when (both time of day and also in conjunction with other activities) your customers are most focused on your content, as well as general mobile and tablet behaviors. An attention shift away from television is happening, it’s just a matter of when it’s most cost-effective to shift your media mix. Make the case for budget re-allocation. Once the research is sound, it’s important to use data to your advantage when making the case to leadership for a budget shift. Social TV is still very new, and its merits are likely not known among key decision-makers when it comes to budgeting for media (especially against traditional cohorts). Use a combination of general industry and social TV data with your customer research. If you’re part of a more traditional company culture that hasn’t yet recognized the potential of social, mobile, and new digital media in general, it may be more fruitful to state your case by suggesting including social TV as part of your brand’s digital or social media budget at first. Once initial results are recognized, larger budget allocation from television funds will be an easier sell. Plan TV creative with attention division in mind. When planning the strategy and implementation of television creative, it’s important to consider how your viewers are consuming its content in relation to other screens. The very concept of social TV indicates a close relationship between television and social or digital channels. Add in the fact that the TV may not be the primary screen of focus, and campaign creative is dramatically affected. Consider how the use of visuals and graphics in creative weighs against other sensory measures – such as sound and touch. Will it be more effective to treat a television commercial as an engaging radio spot, when eyes are so easily averted to alternate, tactile screens? Should you invest more in maintaining and biding community conversation around your brand or program, vs. budgeting big for TV viewership? This is the very idea behind “design thinking” – solving problems based on customers’ needs rather than what you’re comfortable with based on past experiences. Rewind a few years, and anyone in or adjacent to the social space can remember the advice, “the conversation is already happening online, whether you’re there or not. Either you plan for social media now, or your competitors will beat you to it.” Social TV may be in its relative infancy now, but its potential is worth planning for and investing in. Customer attention is already divided, and the division will only continue to grow as we become more comfortable with taking in content via our mobile devices. I predict that next year’s Super Bowl spending will be a more complicated feat than pouring billions into television. Solving for consumer engagement – on their terms – will be more important than ever to driving engagement into the end zone.